The pending home sales index, published by the National Association of REALTORS® ,based upon the number of homes that went under contract but have not yet closed yet, hit 112.4 in April, a 3.4% increase from March and a 14% increase from a year ago marking the largest annual increase in almost 3 years (since September 2012) and the highest level for the index since hitting 112.5 in May 2006 during the height of the boom. St Louis Pending Home Sales On The Rise Too! As the chart below shows, pending home sales in the St Louis area (chart depicts core market of city of St Louis and counties of St Louis, St Charles, Jefferson and Franklin) thus far this year are ahead of this time last year (by 6.8%). Unlike the national data above, our pending home sales this year are not at the highest level since 2006 as at this time in 2013 pending home sales were at a higher level. 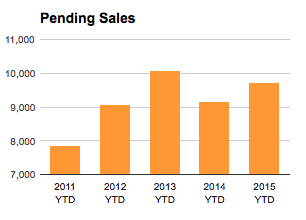 The fact that we cannot keep pace with home sales in 2013 is probably largely due to the lack of inventory of homes for sale in St Louis. 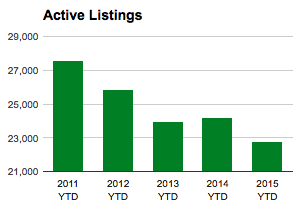 As the chart at the bottom shows, the inventory of active listings (YTD) currently are running well behind the same time in 2013 in fact, with 22,756 active listings we have barely half of the number of listings there were at this time of year in 2013 when there were 43,089 active listings.